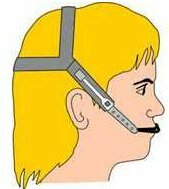 Headgear is typically used in growing patients to correct overbites by holding back the growth of the upper jaw, allowing the lower jaw to catch up. Headgear needs to be worn approximately 10-14 hrs to be effective in correcting the overbite, usually anywhere from 6 -18 months depending on the severity of the overbite and how much a patient is growing. Headgear is also used in adults, but for a different reason. A typical scenario is a case where some teeth are extracted, and front teeth are being retracted (pulled backward). When extraction spaces are being closed, the teeth behind the extraction space slide forward and the teeth in front of the space slide backward. In some situations, to maintain the bite, the orthodontist will not want the back teeth to come forward. The headgear serves to hold them back (maintain anchorage). Orthodontists will want those patients to wear the headgear as much as they can. Realistically for most adults this might only be 8-10 hours per day, but the more the better; even 24 hours would be acceptable. Soreness of teeth when chewing, or when the teeth touch, is typical. Adults usually feel the soreness 12-24 hours later, but younger patients tend to react sooner, (e.g., 2-6 hours). The soreness/tenderness may persist for several days. Usually, the second and third days are the most severe, with reduction in soreness over the next couple of days. Ibuprofen and soft diet are helpful. There is also a device called a "bite wafer," which is a soft U-shaped piece of rubber which patients can gently squeeze their teeth into. The bite wafer keeps the blood circulating around the teeth and lessens the time teeth might be sore. Typically, soreness from the headgear and elastics will attenuate and disappear after a few days, but it may persist for as long as a couple of weeks. Very few patients complain of having sore teeth essentially the whole time. Once the soreness is gone, it is not uncommon for soreness to flare up again, usually just involving a few teeth. Then the soreness disappears again. Soreness tends to leapfrog among different teeth at different times as a result of tooth movement. The key to the fastest relief of tenderness is to continue the wear headgear/elastics even though the teeth are sore. If you stop wearing the headgear or elastics, your teeth will feel better temporarily, but as soon as you resume wearing your headgear, the symptoms will start all over again. Adrian Vogt, DDS, MSD; grew up in Hong Kong and eventually moved to Canada, where he attended Western Ontario University. From there, he went on to finish at the top of his class at the University of the Pacific School of Dentistry, concluding his studies there with a Master’s degree from the graduate orthodontic program. Dr. Vogt's office is in San Mateo, California. His website is www.sanmateobraces.com.